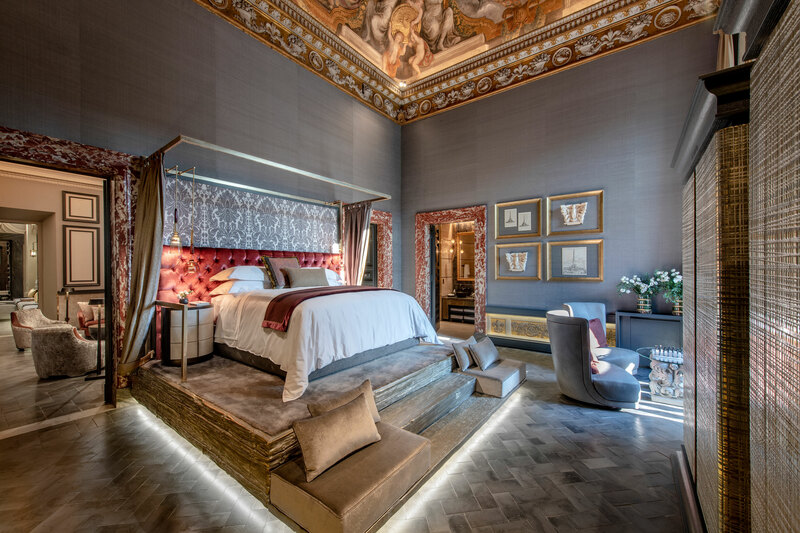 The very concept of meraviglia links seemingly distant historical periods such as the Baroque and our post-modern era in a constant and intimate exchange of allusions, quotations and implications. 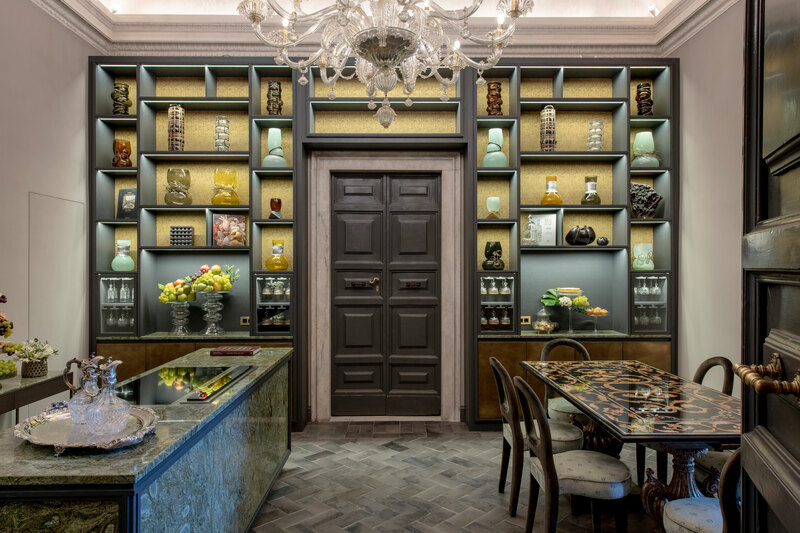 The Holy Deer is a contemporary home immersed within a historical context. 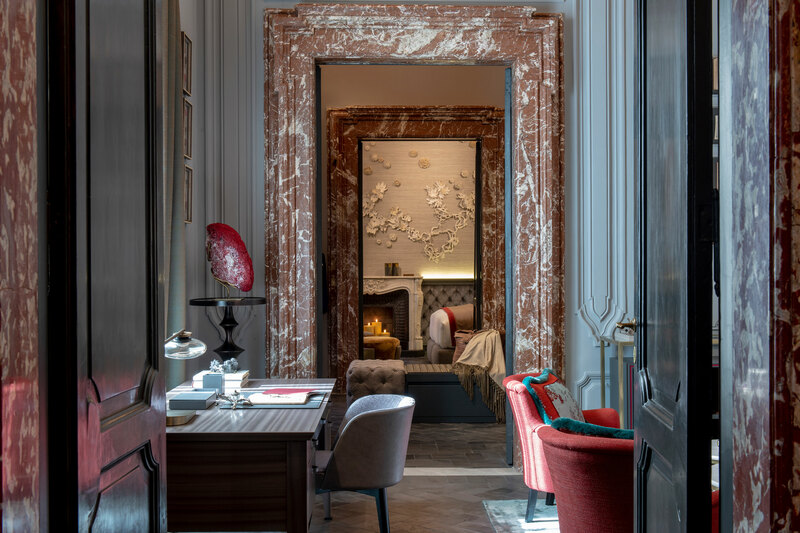 When you arrive at the City Lodge today, emerging from the dim light of the stairs, you first encounter only yourself: an oversized golden Baroque frame, of rare elegance, reflects the visitor’s face in countless rectangles of burnished mirror. Everyday life is transformed into what we would define ante litteram as pixels; that which is ordinary recedes from view and allows a truly unique place to take center stage. We immediately find ourselves in an atmosphere that is somehow both staggering and relaxing. A long corridor girds the entrance, winding both right and left. The Holy Deer is in fact laid out in the shape of a horseshoe. 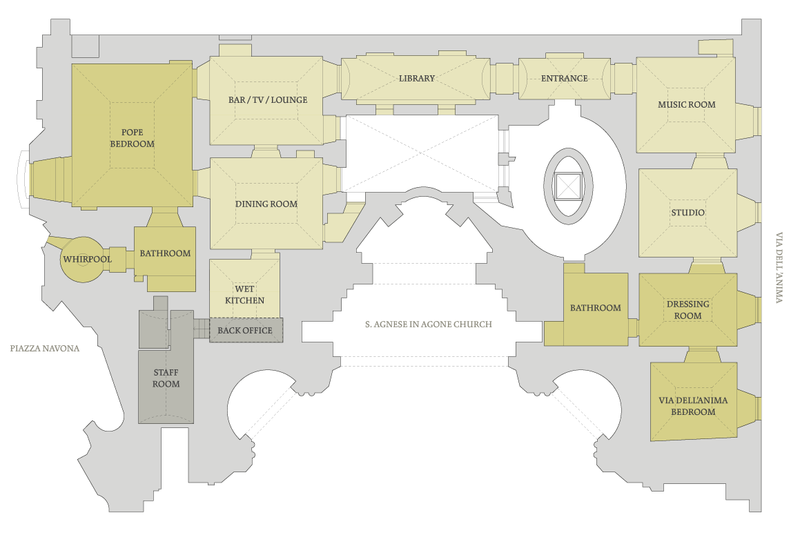 At the two extremes, cleverly tucked away, are the two bedrooms with adjoining baths. 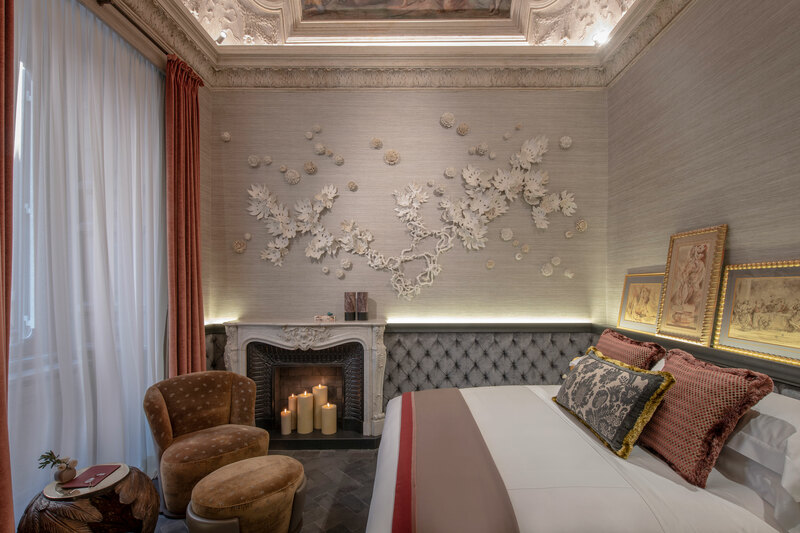 One bedroom overlooks the romantic Via dell’Anima and leads into an elegant walk-in closet; the other, the sumptuous Pope’s Room, looks directly onto Piazza Navona. When you open the doors of the windows, which measure an astonishing four and a half meters in height, in order to access the balcony that overlooks the square, the spectacle takes your breath away: it’s easy to imagine exactly how popes, princes and noble mistresses felt standing here. From this perspective, the sublime style of the Baroque period becomes surprisingly palpable. 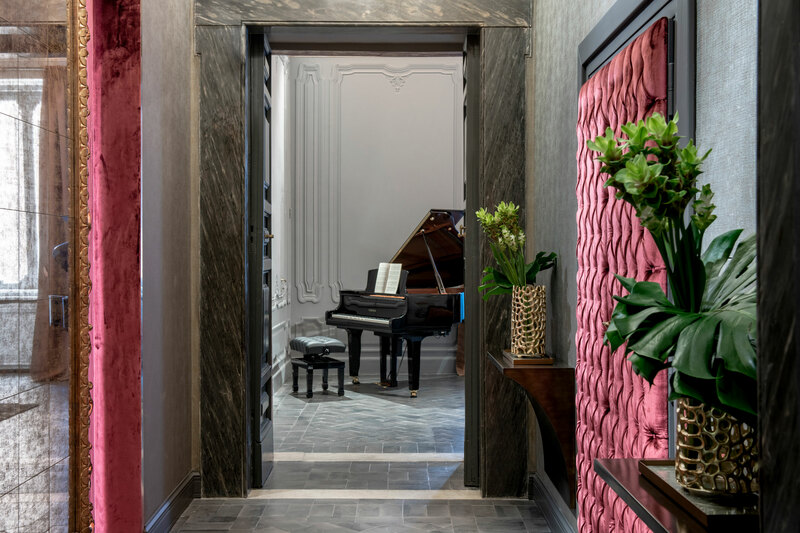 The two secluded rooms are linked to one another through a study, music room, library, lounge for conversing or watching TV, dining room and kitchen. 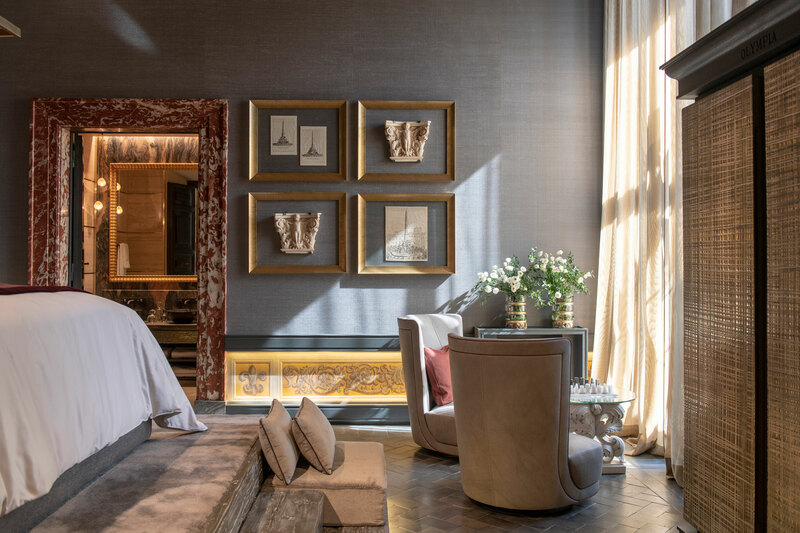 Conceived as a place to gather together and socialize, each of these spaces has been meticulously designed to help guests enjoy the intimacy of a private retreat to the fullest, and to indulge in creative idleness. The muted grey tones of the walls lend a sense of calm to the ambience, steadying the soaring heights, which range up to five meters, and parrying with the optical effects of the frescoes that further accentuate the scale. 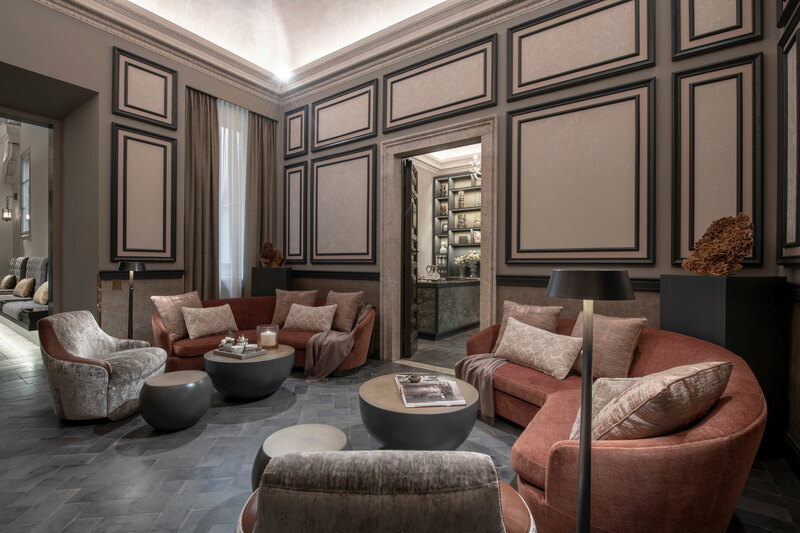 Giorgia and Stefano Barbini found themselves in immediate concord with FM Interior Architects, and the fruit of that collaboration is clearly visible in a masterfully selected palate of colors: hues of grey attenuate the gold and purple-red, evoking the pontiff’s power and passions. Here the sacred and the secular merge, complimenting each other in perfect symbiosis. 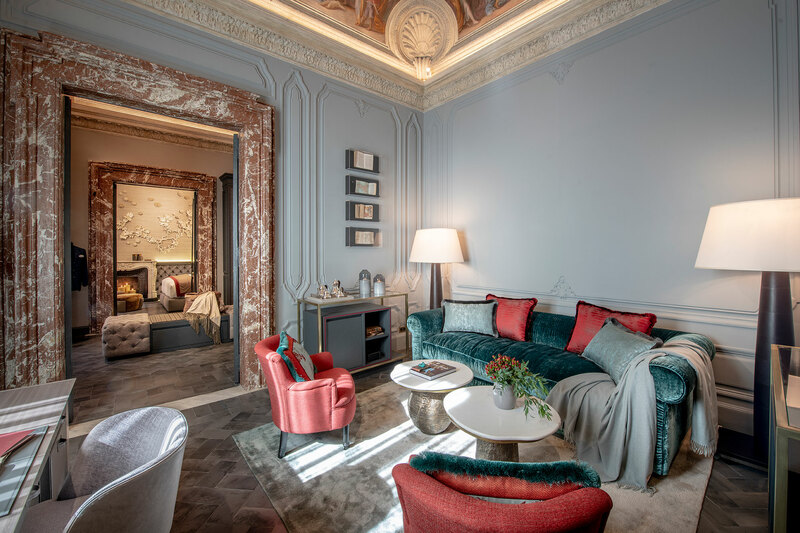 The individual spaces adjoin through open doors, unified by white and gilded stuccos, a grey terracotta floor, double-leaf doors and sumptuous frescoes; the volumes fuse, seemingly paving the way towards infinity. That which is monumental and that which is personal meld at Holy Deer, creating a space of rare beauty and intimacy. Its welcoming embrace is infused with such kindness and informality that entering feels more like a homecoming than an arrival. The structure’s Baroque frescoes are also different from most of their contemporaries, which typically depicted saints and biblical scenes. The Palazzo Pamphili frescoes are an example of mythological iconography. The one illustrating the impossible love between the ill-fated Dido, queen of Carthage, and the Trojan prince Ene is particularly splendid and representative: the successive scenes on the ceiling of the Pope’s Room evoke the passion of the two lovers. 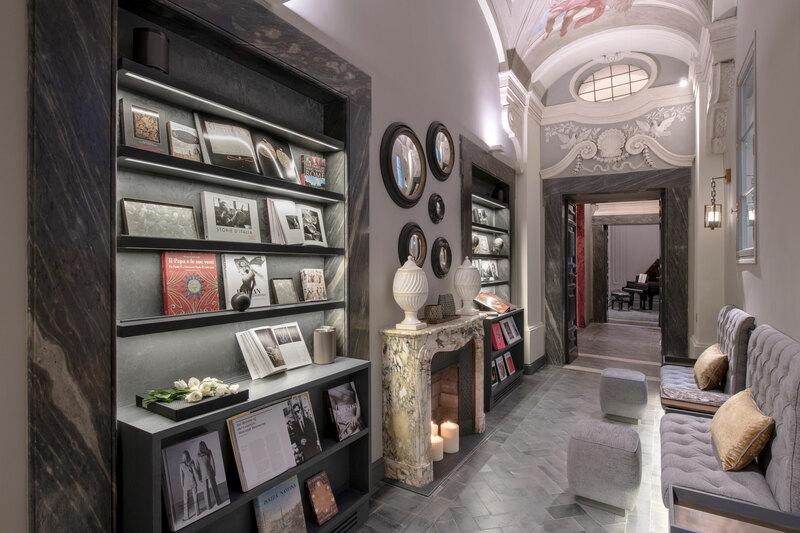 Immersing oneself in the history of those who lived within these walls while still enjoying all the comforts of modern life is truly a meraviglia.